Just like your skin, careful maintenance with the right products is a must to maintain strong, healthy hair. We only use Wella hair colour and in-salon treatments as we believe they yield unparalleled results. That’s why we recommend the home care collection to our clients. Built on experience and supported by extensive research, Wella’s range is sure to encompass the right selection to care for your hair’s individual qualities. 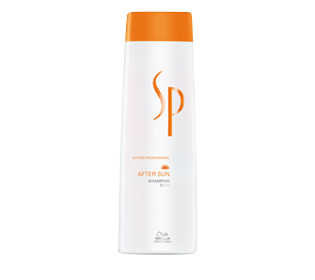 Gentle cleansing after sun exposure.Gently cleanses the hair and body after sunbathing to remove residue of sunscreen, salt and chlorine water. Improves combability. Hair is moisturized and has more shine. Immediate intensive conditioning.Maximum care for sun damaged hair.Provides intense repair and moisture.Gives the hair silky feel and shine. Improves combability. Long-lasting moisture for hair & skin.Intensive regeneration and care for skin and hair. Provides the hair and skin with intense moisture.Hair becomes smooth and easy to comb. Skin is soothed and moisturized. Long-lasting moisture for your hair & skin after sun exposure. Protect from damaging effects of the sun and UV rays. Protect the hair from the innermost. Non greasy formula leaves hair looking natural. Water-resistant. Daily UV protection. 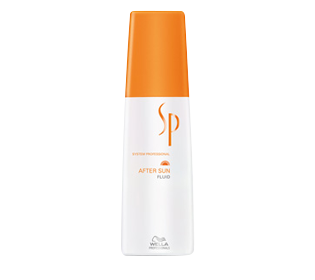 Adds UV protection when used daily with all SP Conditioners.Adds up to 10 hours UV protection in summer light. Protect hair color from fading, shifting and increases color freshness. Provides up to 40% increased color freshness.